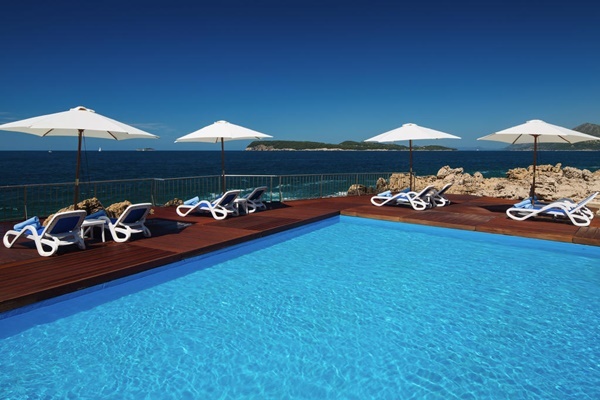 On the Lapad peninsula, just a ten minute drive from the beautiful Old Town of Dubrovnik, the Royal Palm Hotel is located in the Importanne Resort. This hotel boasts stunning panoramic views of the surrounding pine forests and blue waters of the Adriatic. Guests at the Royal Palm Hotel can enjoy all the benefits of a city break along with all the peace of a beach holiday. FROM DUBROVNIK AIRPORT: From the airport take the shuttle bus to Pile Gate (30 minutes bus ride). From there take either city bus No.5 or bus No.6 and travel until the last stop (Hotel Valamar Dubrovnik President). The Royal Palm Hotel is located a few minutes walk from the bus stop. FROM DUBROVNIK PORT/MAIN BUS STATION: To get from Gruz harbour to Royal Palm Hotel take the city bus No.7. Upon getting off the bus take the stairs leading towards the sea. Importanne Resort's main reception is located in the building located at the bottom of the stairs. FROM OLD TOWN: From Pile Gate take either bus No.5 or No.6 and travel until the last stop. The Royal Palm Hotel is located just a few minutes walk from there. The Royal Palm Hotel offers accommodation in 19 luxury and 6 superior suites. Each suite consists of comfortable bedroom (twin & double), spacious living room, kitchenette and bathroom. They are equipped with SAT televisions, phones, mini bar, in-room safe, hair-dryer, work desk, spacious wardrobes and air-conditioning. From rooms' balconies you can enjoy views over nearby Elaphite islands, popular spot for boat trips from Dubrovnik. Guests at the Royal Palm Hotel have the use of two saltwater swimming pools with stunning sea views and can enjoy a range of massages and treatments in the spa, which also boasts a Finnish sauna and steam baths. The Importanne Resort offers two a la carte restaurants and a buffet restaurant, all enjoying elevated al fresco terraces over the Adriatic.